The Ambition Masterpiece Rock Landscape (known simply as the Ambition Masterpiece) is located in Wolmyeongdong. It is beautiful to look at and feels like a part of the natural environment. However, the rock landscape didn’t exist from the beginning. When Pastor Jung Myung Seok grew up, he felt Wolmyeongdong was a desolate and lonely land. Many of his brothers and townsmen left to bigger cities like Seoul. He too joined them for a while. But from 1989, God made Pastor Jung realize the value of Wolmyeongdong and had him develop it. The Ambition Masterpiece actually crumbled five times. (Yes, you read that correctly, five times.) If Pastor Jung had stopped after it crumbled, he would not have been able to actualize the design God had given him. He would have ended up just wondering what it could have been. But he didn’t give up. At first, there were no quality rocks in Wolmyeongdong. So Pastor Jung built the Ambition Masterpiece along with other volunteers using whatever rocks they could get their hands on. In the process of having to rebuild the rock landscape each time it crumbled, they obtained a large quantity of high quality rocks. In the end, Pastor Jung and the long-term volunteers developed the know-how for how to build the rock landscape while gaining the rocks they needed. Like this, God helped them complete the Ambition Masterpiece. People develop the Ambition Masterpiece with whatever rocks that could be found in the area. When the Ambition Masterpiece was developed for the sixth time, God changed the way we were building it so that the middle portion of the landscape would not have any rocks that were erected upright. Instead, we laid the rocks sideways with their flat surface up. As a result, we set the good quality tiger-skin rocks by laying them sideways in the lower and middle portions of the landscape so that people could sit on them like a chair. As for the upper portion of the Ambition Masterpiece, we used a crane to set the rocks upright and placed them to look like an open fan. In a way, it also looks like an open folding screen. Since we built it like this, the top part of the landscape turned out really splendid. When Pastor Jung looked at the Ambition Masterpiece after constructing it for the sixth time, he realized that all the large pine trees he had planted in the middle of the Ambition Masterpiece had all gotten sick and died. So the middle portion of the rock landscape did not have any pine trees. Also, since he had set the rocks in the middle of the landscape flat like a chair by laying them sideways, the middle portion looked really empty. You couldn’t see anything if you looked. It left something to be desired. However, whenever Pastor Jung looked at the Ambition Masterpiece from the sports field, he felt a bit uncomfortable. The Ambition Masterpiece was not pleasing to his eyes. So later, he planned on erecting two huge 87-ton boulders in the middle, but for some reason, he ended up setting them up on the left and right ends of the lower part of the rock landscape. The Ambition Masterpiece rock landscape is the Trinity’s masterpiece. Pastor Jung actualized the Trinity’s design by guiding the landscaping. The greatest masterpiece in the Natural Temple is the Ambition Masterpiece. Everything revolves around it. The Ambition Masterpiece contains four meanings. First, it symbolizes the great masterpiece of this new era. Second, the rocks we placed in the Ambition Masterpiece symbolize believers whose faith in God are solid. Third, it symbolizes the fact that God must make the design and those He loves must act accordingly. Fourth, it shows how the Trinity are with us until the end. The Ambition Masterpiece and the surrounding environment in Wolmyeongdong are places where we welcome all people to enjoy. Many people say going to Wolmyeongdong has changed their lives physically and spiritually. There is peace and serenity imbued in this place, and you can feel the presence of God here. It is a genuine feeling that I cannot describe with words. 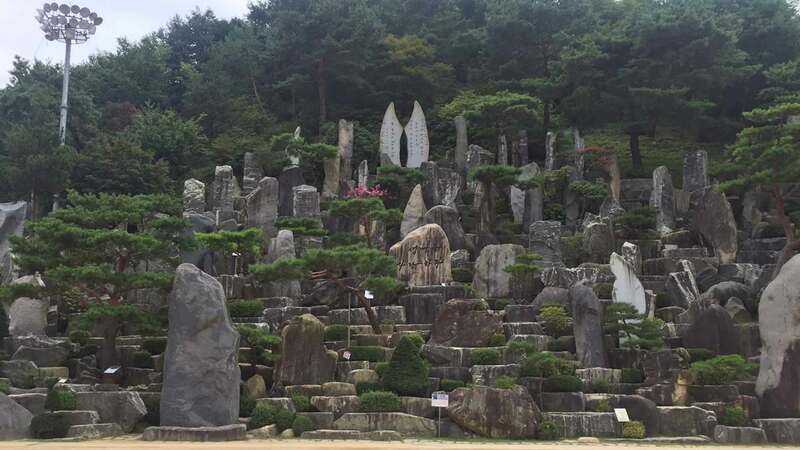 If ever you have the chance visit the natural temple in South Korea, Wolmyeongdong will not disappoint you!